LeBron James’ worst nightmare has become reality. 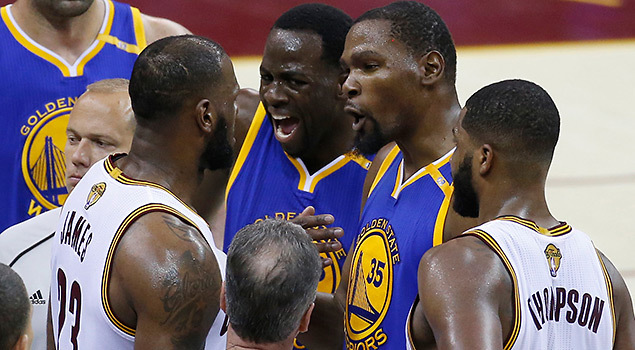 When Kevin Durant joined the Golden State Warriors last summer, LeBron knew he’ll be facing a “worthy” opponent in the NBA Finals but he didn’t know just how worthy. After five brutal games in The Finals, LeBron got his answer. The Warriors are a monster. A juggernaut. An unstoppable force. A team with a collection stars who are entering their primes and poised to rule the basketball world in the next four to five years. In winning their second NBA championship in three years, the Warriors put the rest of the league on notice. They raised the bar so high that they’re turning the NBA into FIBA. One Dream Team playing for gold, while the rest of the world are playing for silver. Speaking of silver, NBA Commissioner Adam Silver hinted that a sweep by the Warriors over the Cleveland Cavaliers would be bad for the league. Well, it wasn’t quite a sweep but it took an NBA Finals record 24 3-pointers and 86 first-half points by the Cavs just to put a dent on the Warriors’ near-perfect playoff run. During their historic 16-1 blitz through the playoffs, the Warriors set all kinds of records, including the longest winning streak in one postseason (15), highest winning percentage in the playoffs (.941), fewest turnovers in a Finals game (4), and largest average margin of victory entering the Finals (16). Golden State also averaged 119 points per game, three points better than second-place Cleveland and 11 points better than third-place Indiana. The Warriors’ dominance raises this question: Are the Warriors the best team of all-time? Oddsmakers at Las Vegas’ MGM Grand favored the 2017 Warriors over Michael Jordan’s 1996 Chicago Bulls squad by 8 points in a hypothetical matchup on a neutral court. This is a Bulls team that won a then record 72 games and boasted three Hall of Famers on the court (Jordan, Scottie Pippen and Dennis Rodman) and one Hall of Fame coach (Phil Jackson). Jordan’s Bulls are the measuring stick whenever G.O.A.T. teams are brought up. MJ and Co. are the linear NBA champions based on this formula: Magic’s Lakers beat Bird’s Celtics, Magic’s Lakers lost to Isiah Thomas’ Pistons, Isiah’s Pistons lost to Jordan’s Bulls. The Shaq-Kobe Lakers are also worthy bringing up, but a two-man team can’t beat the 2017 Dubs. We’ve seen that already in this year’s playoffs. Just ask LeBron and Kyrie Irving. The Bulls could definitely matchup with any team on the defensive end, especially against the 2017 Warriors. Jordan’s Bulls held teams to under 93 points and 44 percent from the field. Jordan, Pippen and Rodman are considered three of 10 best defenders of all-time, and guard Ron Harper and center Luc Longley are underrated defensively. Can the Bulls stop the Warriors? Maybe not, but they can at least slow them enough to stay within striking distance. That’s IF we’re playing 1990s-style defense, in which hand checking and hard fouls are allowed. If today’s rules apply, the Bulls will struggle to slow down KD and the Splash Brothers. The length of Jordan and Harper will present Steph Curry and Klay Thompson a difficult challenge, and Jordan can lock down either one at any point. Pippen will likely be assigned to guard Durant; Rodman and Draymond Green will wrestle at power forward and Luc Longley and Zaza Pachulia lock horns at center. Both teams like to go small, so Andre Iguodala and Toni Kukoc could play a pivotal role as 6th men off the bench. One problem the Bulls could have matching up is reserve guard Shaun Livingston. At 6-7, Livingston towers over Randy Brown and Steve Kerr (the player) and the Bulls may have to double Livingston in the post. But here is where it gets dicey for Chicago. Offensively, the Warriors average around 116 points per game. That is 11 points better than the Bulls, who have just three players average double figures (Jordan, Pippen, Kukoc). Jordan would have to hit his average (30) and then some. Jordan should be able to hit his average against Klay, but it won’t be easy. And if Klay gets in foul trouble, the Warriors could also throw Iguodala at MJ. Pippen averaged 19 points per during the 1995-96 season. But against 6-10 Durant, Pip could have a difficult time reaching that total. The only other offensive weapon the ’96 Bulls had was Kukoc. He averaged 13 points per game. Iguodala should get the assignment on Kukoc, with some help from Livingston. This is why Vegas oddmakers favor the Warriors over Jordan’s Bulls. They anticipate that the Warriors cannot be stopped on offense and play enough defense to win the series. The other big factor is depth. The Warriors have two MVPs (Durant and Curry) at the height of their powers supported by two top-10 players in Green and Thompson. That’s four future Hall of Famers in their primes. No team in the history of the game has ever had that luxury. We all may be prisoners of the moment elevating the 2017 Warriors to the top of the NBA all-time list and too quick to dismiss the great teams of the past. But given the impressive statistics and the unprecedented talent that these Warriors possess, they are definitely worthy of being No. 1.